Longtime 1800Pocket/PC readers will remember FB Pages Manager from Imagination Overflow as we’ve covered it on the site quite a bit. 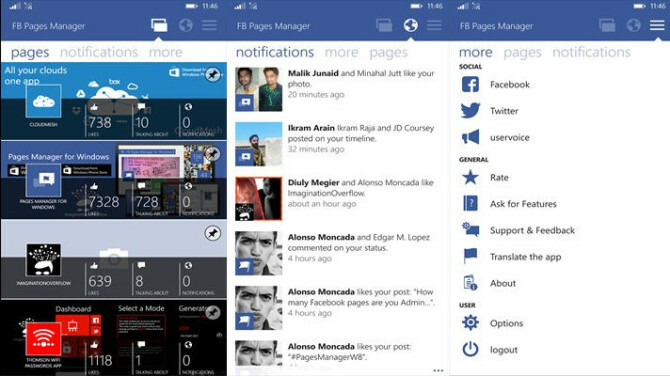 Back in October, the app received an update that added News Feeds for pages, post enhancements, and a few other things. During that time, I’ve been testing the app off and on to manage the official pages for 1800Pocket/PC and TruTower as well as my own budding fan page. FB Pages Manager comes in two flavors: the free version or the paid “Pro” version. I’ve been using the Pro version — it’s going for $1.99 in the Windows Store — and have been quite impressed with the app’s performance on all of the devices I’ve tried it on. I’ve used both versions, but most of my experiences have been with the Pro version. Before I get to the performance, though, let’s go through a brief overview of the app and its features. FB Pages Manager is an unofficial app that allows you to manage all your Facebook pages and see notifications for each page as well as create new posts, add photos, and manage existing posts. You can also respond to messages, reply to comments, view page insights, like or unlike posts, and even pin each page to your Start Screen or Start Menu. There are toast notifications so you never miss a moment with your followers. 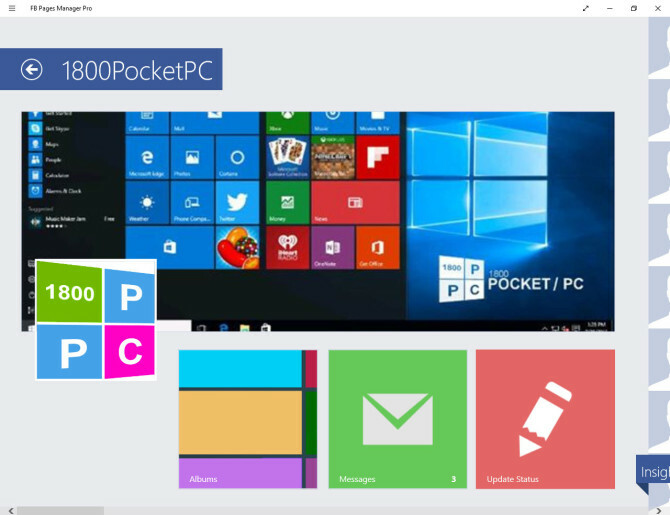 In addition to my desktop PC, I’ve used the app on a Surface Pro as well as a Microsoft Lumia 640 XL and Lumia 635. My primary device of use has been the Lumia 640 XL, so most of my experiences have been on that device. On the 640 XL, I’m running the latest build of Windows 10 Mobile in the fast lane. I’m also running Windows 10 on my desktop PC. On both of these devices, the app hasn’t experienced much in the way of crashing, though it can be slow at times. I will say the app is easier to use on the Lumia 640 XL. The screen is big enough that it’s not difficult at all to see what you’re doing. I’ve found that using a mouse in the app can be annoying at times due to the scroll bar going side to side at some points and going up and down at others. In particular, the list of notifications will be a “scroll up or down” moment. You’ll want to make sure your mouse pointer is hovering over the headers — “Notifications” and “Pages” — before scrolling if you choose to scroll left or right beyond the notifications and see all your pages. This isn’t really much of a problem using the touch screen on the Surface. It would be really nice to have the ability to post multiple photos at once rather than just one photo at a time. In order to post multiple photos (as in an album), you have to use the website. You can post multiple photos using the official Facebook Business Pages Manager app on Android, so it would be nice to see the same functionality make it over to Imagination Overflow’s app on Windows. You also can’t tag photos as you can with the official app, so these missing features might be noticeable for some. As you can see, the cover photo as shown in the app on the desktop is noticeably blurry, although that is a minor detail. It would be a nice touch to be able to update the cover photo and page image, although I’m not sure if Facebook’s APIs allow for these types of intimate changes on pages. Overall though, the app offers all of the functionality you’ll need to stay on top of your pages and keep them growing while keeping things simple and efficient. The notifications are separate from your personal Facebook account so you don’t have to worry about having to go on the website to check your pages individually as along as you have FB Pages Manager installed. It would be far more economical to get the Pro version for $1.99 and would also be well worth the expense. Either way you decide to get the app, you’ll find there’s much to like in it, even if there are some features noticeably missing. You can get either app via the QR codes and download links below.